Wow the crowds with Fantastic Grilled Corn on the Cob. 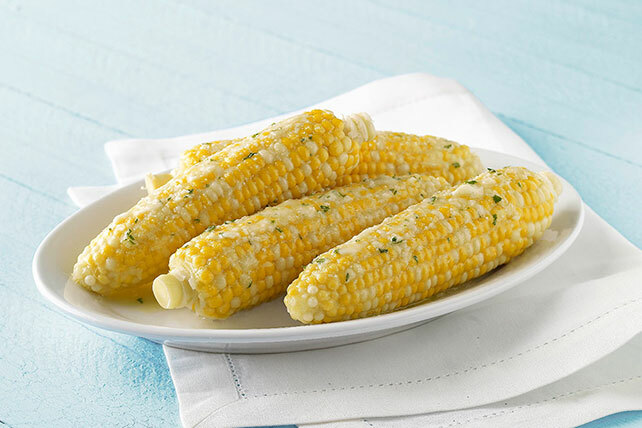 This Fantastic Grilled Corn on the Cob recipe is just as simple as it is scrumptious. Rinse corn under cold water; wrap individually in Reynolds Wrap® Aluminum Foil. Grill 15 to 20 min. or until tender, turning occasionally. Mix remaining ingredients; spread onto corn. For a great summer meal, serve corn with grilled chicken breasts and a fresh fruit salad. Substitute 2 Tbsp. KRAFT Original Barbecue Sauce for the cheese and parsley. Substitute 2 Tbsp. KRAFT Classic Caesar Dressing for the cheese and parsley. Substitute 2 Tbsp. KRAFT Sun Dried Tomato Vinaigrette Dressing for the cheese and parsley. Substitute 2 Tbsp. KRAFT Tuscan House Italian Dressing for the cheese and parsley. Remove hot foil-wrapped corn from the grill and stack on a platter. This will help the corn to stay warm longer. Then, let each guest select their own ear of corn and spread it with the butter mixture immediately after removing the foil. Barbecue Butter: Substitute 2 Tbsp. KRAFT Original Barbecue Sauce for the cheese and parsley. Caesar Butter: Substitute 2 Tbsp. KRAFT Classic Caesar Dressing for the cheese and parsley. Tomato and Herb Butter: Substitute 2 Tbsp. KRAFT Sun Dried Tomato Vinaigrette Dressing for the cheese and parsley. Tuscan Herb Butter: Substitute 2 Tbsp. KRAFT Tuscan House Italian Dressing for the cheese and parsley.